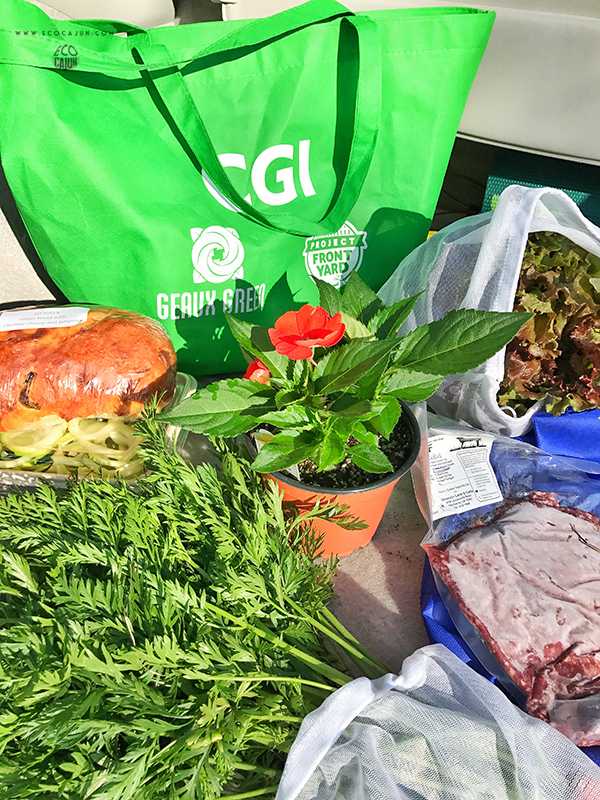 As part of my involvement with Project Front Yard's Waste Free Day lunch challenge this week, I've been on my own journey of sorts to really demonstrate zero-waste efforts when it comes to grocery shopping. So this weekend, I visited both the local farmer's market and my nearby grocery store to pick up groceries for this week (with a special focus on my lunch for Wednesday), and really paid attention to reducing waste. How did I do? Well, I would give myself a B for my efforts and for what I brought home. 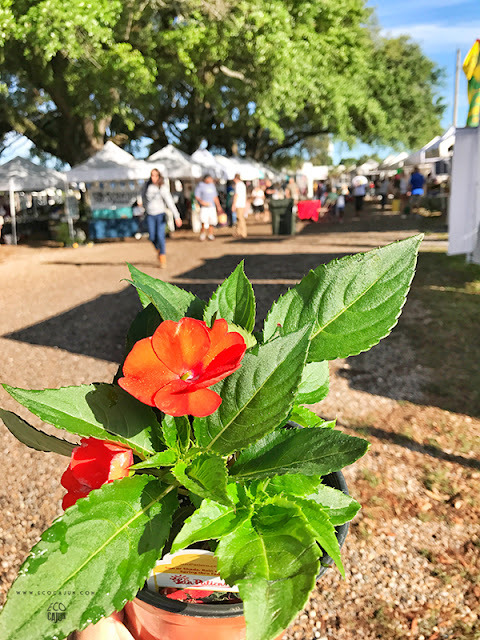 It's definitely a challenge to shop zero-waste, especially in an area not so accustomed to it, but once you get in the habit of knowing what to look for and where to shop, it will become much more feasible. The main challenge comes from packaging, so it's important to be mindful of what's necessary and what's not. At the farmer's market, I shopped around to look for the best items with the least amount of packaging. I picked up some red leaf lettuce and a bunch of carrots that were packaging free, and I put them in my cloth produce bags. I opted for some zucchini noodles from a woman who makes fresh pasta, and while they are prepackaged, I chose them because of the compostable cardboard container. Understandably, the ground beef I purchased was vacuum packed in plastic, but I'm not sure there is a better feasible alternative. Oh, and I had to pick up this flower, because look how adorable it is! The grocery store is definitely a place where I need to brainstorm ways to minimize my waste. My husband and I tend to eat a lot of chicken, and the packaging at the store involves styrofoam trays and sealed plastic wrap, but I'm not yet sure what the alternative is. 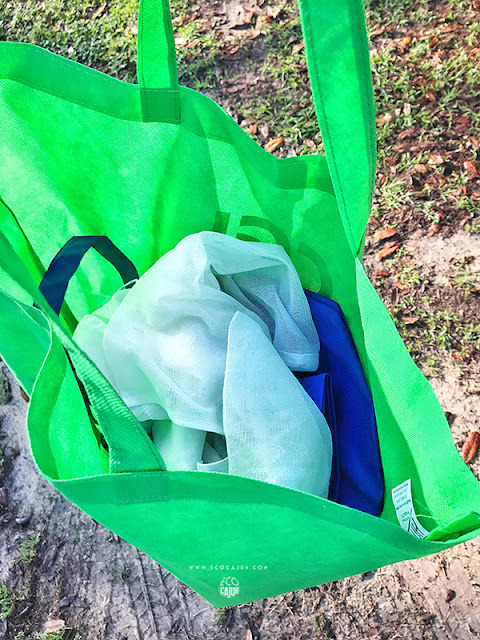 This weekend, I tried a few new things by bringing a few very lightweight reusable plastic containers in, along with my standard cloth produce bags and shopping bags. I wanted to try to use my own containers at the deli counter, instead of getting my meat in plastic bags, but my containers weren't large enough. 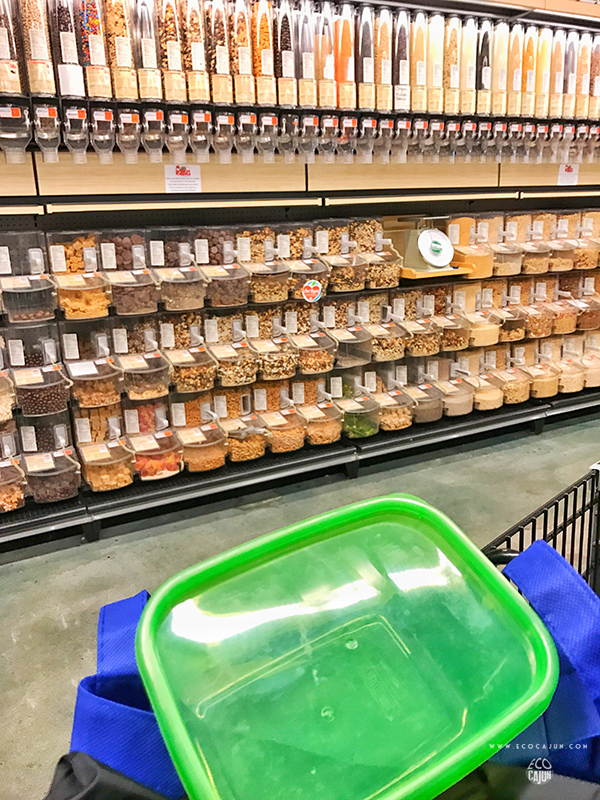 I'll admit, I have yet to embrace bulk bins. 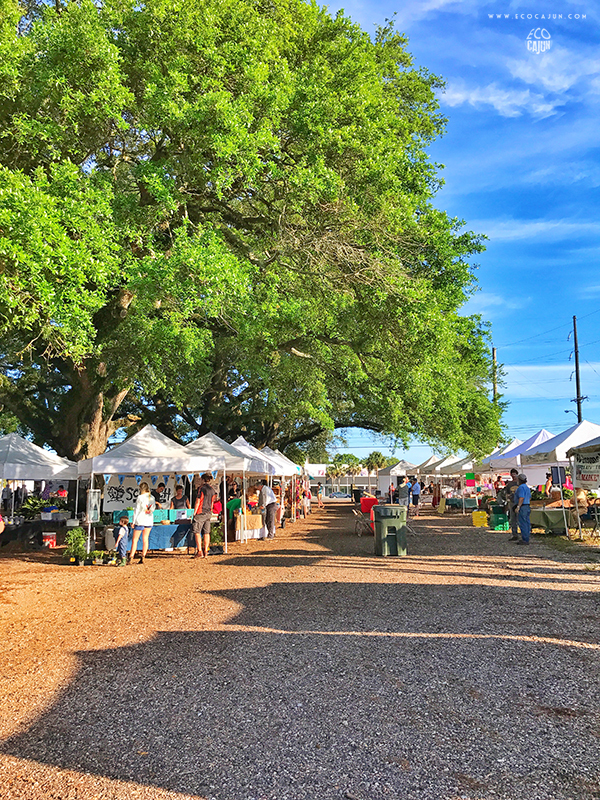 It's definitely something I need to explore a bit more in Lafayette, just to see what's available. I'm very interested in trying out the bulk coffee beans. This weekend, I filled up one of my own containers with some dried veggie chips, and another with some dry roasted sunflowers seeds for the husband. The containers I had were very lightweight, so I wasn't worried about paying extra for them. One idea I thought of is to simply reuse the plastic containers you get from prepackaged items or deli bar items at the grocery store. They're most likely not curbside recyclable, and they're clear and weightless. In the regular grocery section, I wasn't quite waste-free, but I was mindful of anything overly packaged. Going bagless for single items. There's no need to put one lemon in a plastic produce bag, or even a cloth one. I left my lemon, garlic and mango unbagged. Using cloth produce bags. 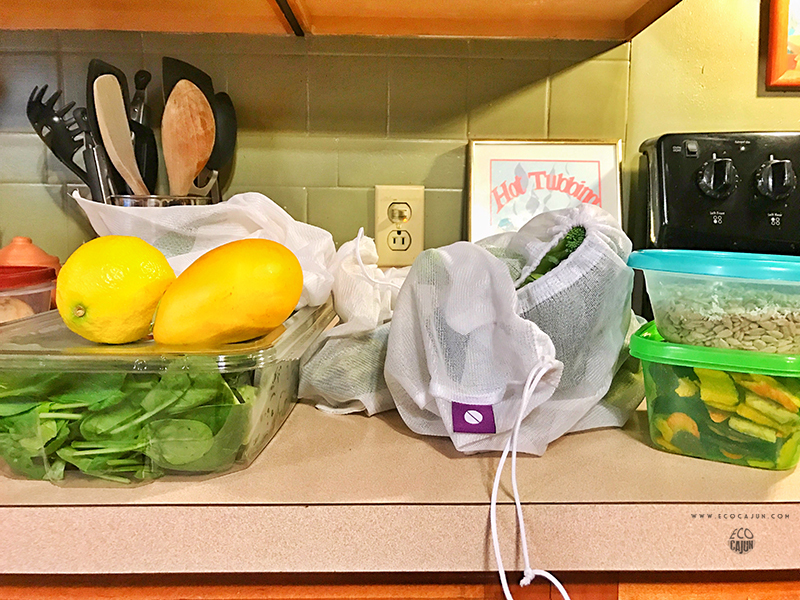 I picked up three heads of broccoli, a bunch of asparagus, and a bell pepper, and bagged them with my cloth produce bags. Choosing recyclable packaging. My husband and I eat spinach pretty regularly, so on this trip, I weighed the options: bagged spinach or plastic carton spinach. The plastic carton is a #1 type of plastic, which means it can be recycled curbside - but the plastic bag cannot. So I went for the more recyclable option. It's still not the BEST option, but it's BETTER. One note about the produce section: it's very easy to end up with a lot of unnecessary waste. Please, please avoid the produce needlessly wrapped in plastic or on a styrofoam tray. You don't need shrink-wrapped cucumbers, or potatoes, or bell peppers in a plastic bag, or corn on the cob on a styrofoam tray and wrapped in plastic. There is nothing convenient about that! 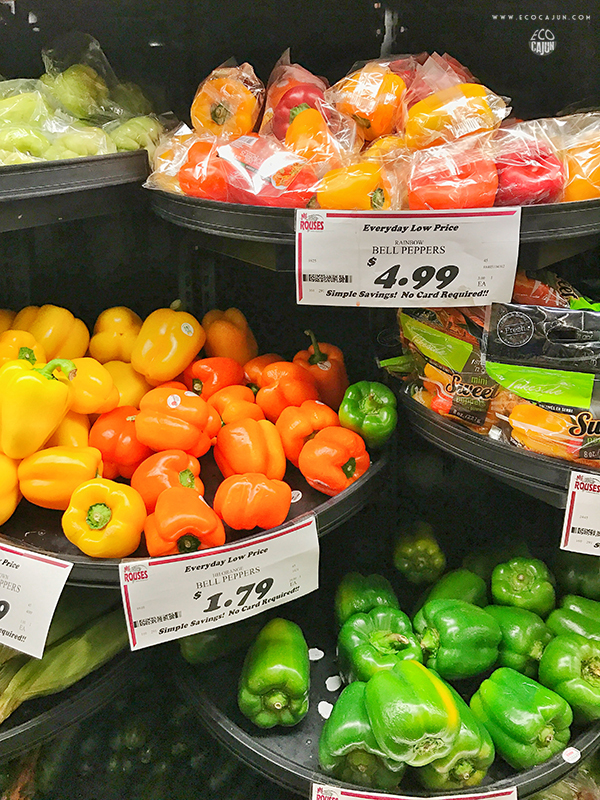 This photo shows an easy to way to minimize waste: just pick three of your favorite bell peppers and leave them unbagged, and skip the plastic-wrapped ones. I do not understand the logic behind this at all! If you use heavier items like reusable glass jars, weigh the container when it's empty and mark that weight on top, so the cashiers can deduct that from the overall food weight. Always check with your deli or meat counter to see if they will oblige using your containers. Food safety and sanitation laws may prevent it. 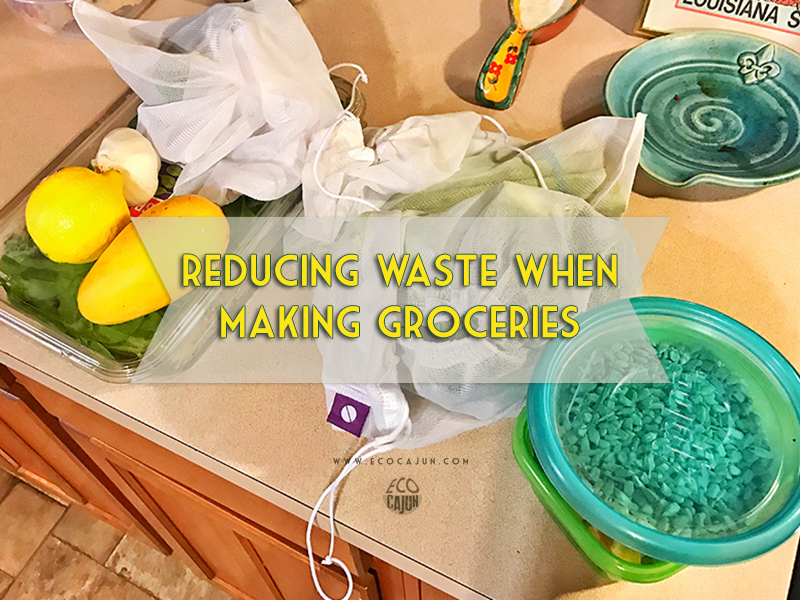 I'm still a long ways from being zero-waste, but these habits are a huge step in the waste-free direction. 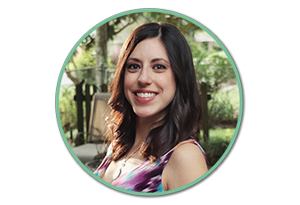 Tomorrow morning, I'll be sharing the next phase of the zero-waste lunch challenge - how to actually pack a waste-free lunch!